Australia-based slot machine maker Aristocrat Leisure Ltd on Thursday reported net profit after tax for the fiscal year ending September 30 up 9.6 percent year-on-year, on revenue up 44.7 percent. Such profit was AUD542.6 million (US$396 million), compared to AUD495.1 million in the prior-year period. Revenue for fiscal 2018 reached nearly AUD3.55 billion, compared to AUD2.45 billion a year earlier. Aristocrat Leisure said that group-wide on a normalised basis – excluding the impact of certain significant items and adjustments – its net profit after tax and amortisation grew by 34.3 percent year-on-year, to AUD729.6 million. Operating revenue on a normalised basis stood at AUD3.62 billion, up 47.7 from the previous year. The company said the improved results “reflected the strong performance delivered across the group’s global portfolio,” including profit growth of 16 percent in the Americas land-based business, a 9-percent lift in profit in the Australian and New Zealand markets, “and transformational profit growth of over 170 percent in the digital business, with sustained organic growth supported by acquisitions”. Earnings before interest, taxation, depreciation and amortisation (EBITDA) for the latest 12-month period increased 32.7 percent year-on-year, to nearly AUD1.33 billion. EBITDA margin however declined by 4.1 percentage points, to 36.7 percent. “EBITDA margins remain strong … reflecting high quality of earnings and growth across strategic recurring revenue segments, offset by higher contribution from lower margin digital social casual games and continued reinvestment in the business,” said the slot manufacturer in a filing to the Australian Securities Exchange. For the latest 12-month reporting period, the Aristocrat board authorised a final dividend of AUD0.27 per share – in aggregate AUD172.4 million – franked at 100 percent. The final dividend is likely to be declared and paid on December 19. Trevor Croker, Aristocrat’s chief executive, said in a prepared statement the firm had “delivered strong, high quality earnings growth” against a backdrop of “mostly flat markets and increasing competitive pressures”. Aristocrat completed in October 2017 the acquisition of social gaming company Plarium Global Ltd, involving a consideration of US$500 million. In January, the slot manufacturer finalised the acquisition of social casino firm Big Fish Games Inc, for a cash deal valued at US$990-million. In Thursday’s statement, Mr Croker said that 65 percent of group revenues came from recurring sources – including gaming operations and digital social casino – during the reporting period. JP Morgan Securities Australia Ltd said in a Thursday note that Aristocrat’s revenue for financial year 2018 was below the brokerage’s forecast “due to AUD31 million increased interest and corporate costs” related to increased debt levels to fund the Plarium and Big Fish acquisitions. Analysts Donald Carducci and Abhinay Jeggannagari said the results of the digital segment were “a miss as the segment’s profit margin (32.8 percent) was lower than fiscal year 2017 of 41.5 percent due to scaling of the digital business following the Plarium and Big Fish acquisitions implying earnings contribution from the acquisitions was likely weaker than expected”. 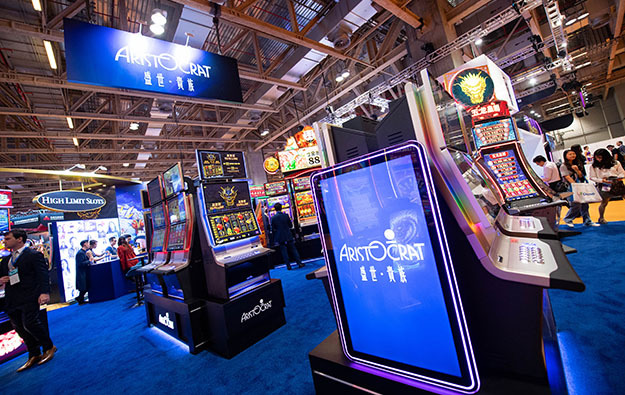 Aristocrat gave on Thursday a brief forecast for fiscal 2019, saying it anticipated continued business growth, with “incremental gains” in outright sales and expansion in gaming operation in the land-based sector. The firm said additionally it expected further growth in the digital segment, “supported by new game releases with a significant increase in user acquisition investment”.